This post and the following 5 contain galleries that cover the motorcycle racing for the Classic Pre ‘63 class which are largely ‘girder forks’ motorcycles, that merge with telescopic forks machines from the mid 50s through to ‘63. The girder forks racing machines from the 30s and 40s are rare birds, highly prized hard-out competitors at the 10th Anniversary Burt 2015. The girder forks class features Phil Price’s superb collection of original 70–80 year old Velocette racing machines, race-prepped and in fine fettle due to the knowledge and care of Wellington Velo man, Nic Thomson, and deftly ridden by Bill, Cloud, Chris and Phil. 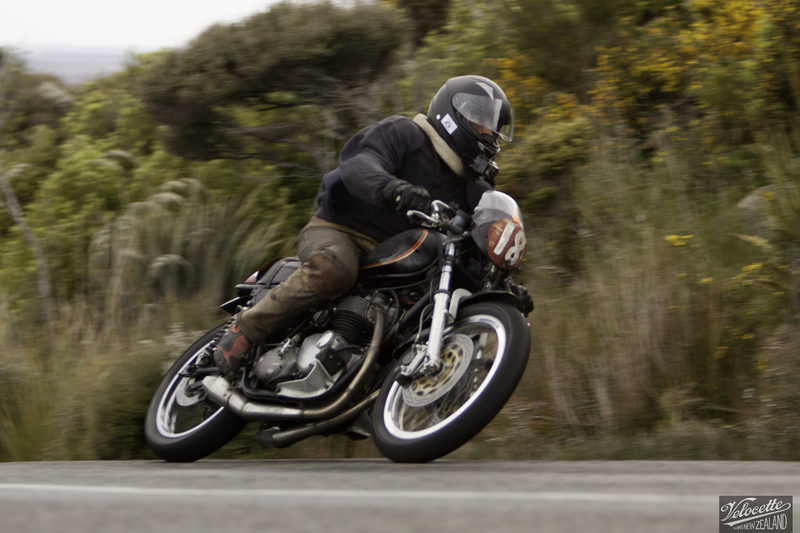 The photos document 3 of the Burt’s 6 events at the tenth anniversary Burt Munro Challenge in November 2015 that these machines were entered in, kicking off proceedings on Thursday 26th Nov with the Bluff Hill NZ National Hill Climb championships. The Teretonga Circuit Races & Practice Day spanned Friday–Saturday and the event culminated in the hugely successful new Honda Invercargill Street Races on Sunday 29th. The trio of cammy 350cc KTTs and the Velocette “Big Velo” 500 competed in the Pre ‘63 (with girder forks) Class along with Neville Mickleson’s KTT, Francie Winteringham and Rhys Wilson’s Rudges, a Triumph an Indian and other famous marques pictured below. 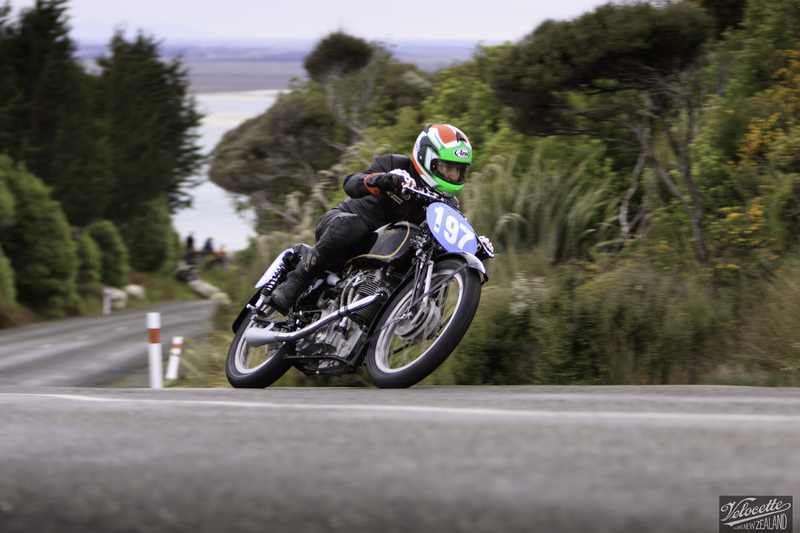 Riders from the VRNZ camp, Chris Swallow and Cloud Craig-Smith also raced machines in the Classic Pre ‘63 class, and the Post Classic Pre ‘72 class, at Teretonga and the Street Races. 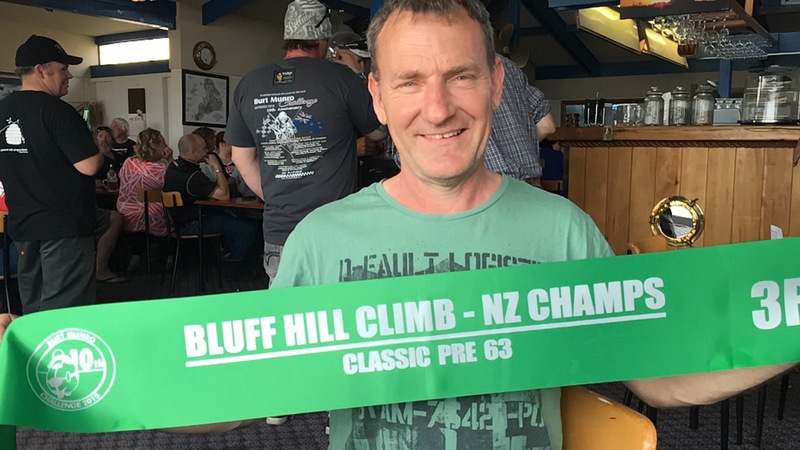 VRNZ Team leader Phil Price with Graham Peters’ Bluff HIll Climb Champs Pre ‘63 Class sash at the Anchorage Pub, venue for the debrief after the event on Thursday evening. 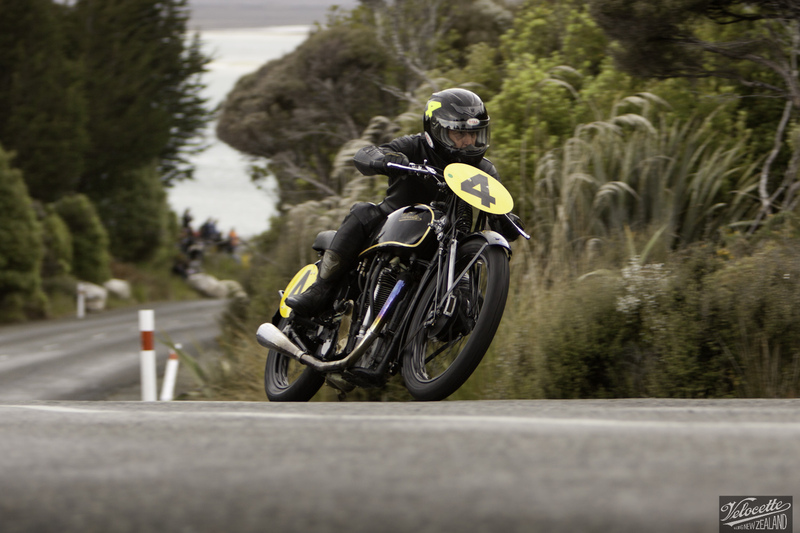 All of the Classes of motorcycles that raced at the 2015 Burt at the Hillclimb, Teretonga and the street races will be added as time permits. I’d like to thank all the riders who put it all on the line, their support crews, the event marshalls, organisers, admin and sponsors that made the 10th Burt such a festive, thrilling spectacle. 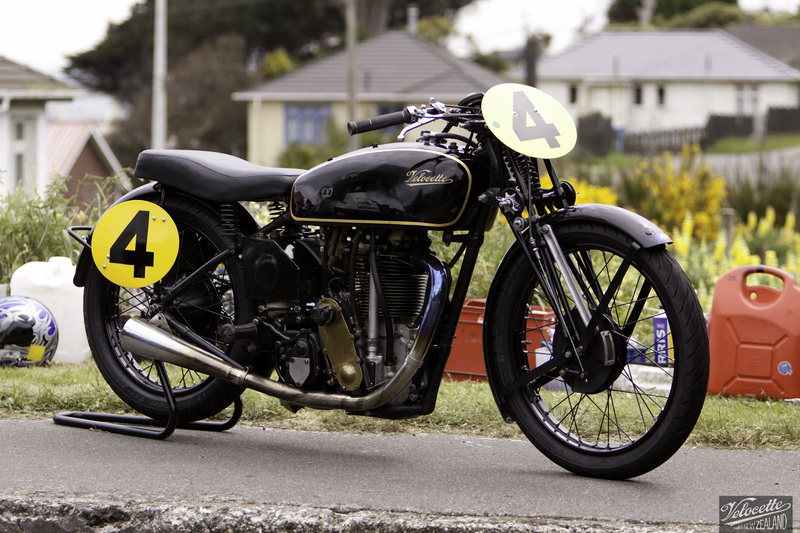 Finally kudos to Nic Thomson for the outstanding achievement of developing, race prepping and fettling the four Classic Girder Velos that achieved five historic wins at the 2015 Burt and acknowledge the remarkable fact also that all bar-one of these 80 year olds both started and finished every event entered over the four thunderous days in November 2015. Bill Biber aboard the 1934 “Big Velo” 500 rounds corner 5 on his first timed run. Flagstaff Road is a steep 1.4 km public road that snakes its way up Bluff Hill. With a few short straights, tortuous curves flanked by rocky cliffs, steep drops and demanding surface conditions that includes a small stream running across the exit of corner four the Bluff Hill course was a formidable challenge with which to kick off the start of A Decade of the Burt. After the Marshall’s briefing, Machine Scrutineering and Riders’ Meeting the Hill Climb event started at 09:40 Thursday morning with a series of two practice runs up Flagstaff Road for each competitor before competition commenced. The competition consisted of a couple of official timed runs for competitors in each class entered. 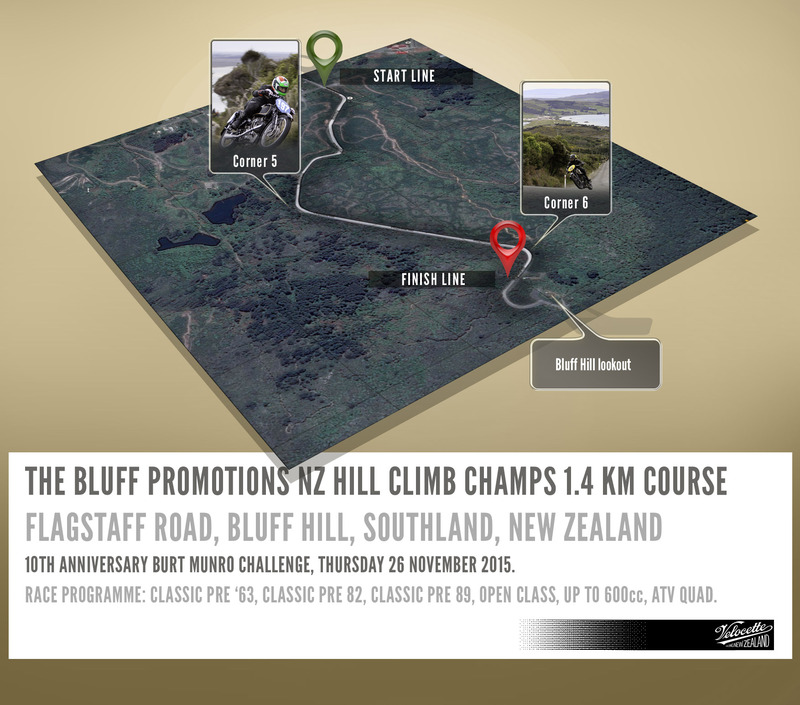 The Bluff NZ Hill Climb Championships 1.4 km course map showing gallery photography locations. For VRNZ in the Classic Pre ‘63, Girder fork class Rider 4 Bill Biber (1934 “Big Velo”) and Rider 197 Phil Price (1934 KTT) were competitors. Also in the camp was the Pre ‘63 Hill Climb class-winning Rider 85 Graham Peters (1958 BSA Goldstar) who won the Classic Pre ‘63 class in 55.41 secs, not too shabby considering the fastest time of the day was set at 46.64 secs by Tony Rees aboard his Open Class 2013 Honda CBR 1000. 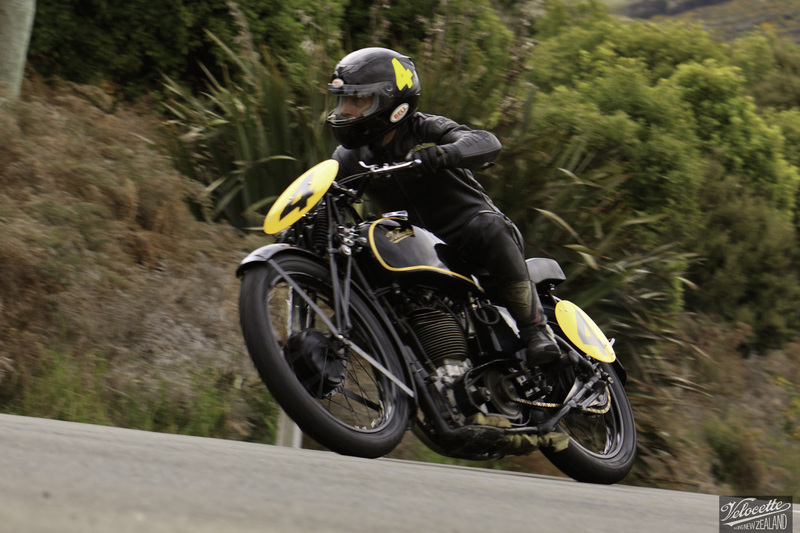 Phil Price roars around Corner 5 aboard the 1934 KTT MKIV at the 2015 Burt Munro NZ Hill Climb Champs time trial. Bill Biber enters the final turn at the top of Flagstaff Hill aboard the Big Velo 500. 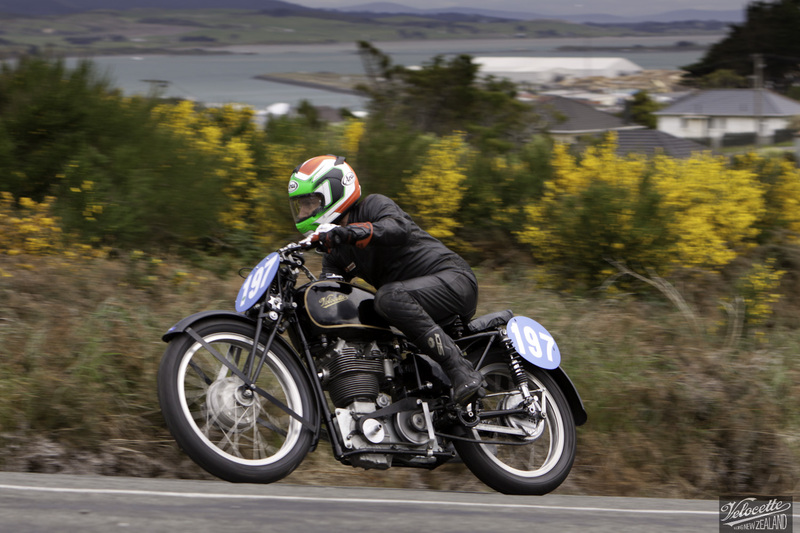 Classic Pre ‘63 Class winner BSA Goldstar 500 flies up Bluff Hill in in 55.41 secs. The 1958 BSA Goldstar with Graham Peters, Pre ‘63 Class winner aboard, flies out of Corner 5 on his way to an impressive 55.41 second finish. 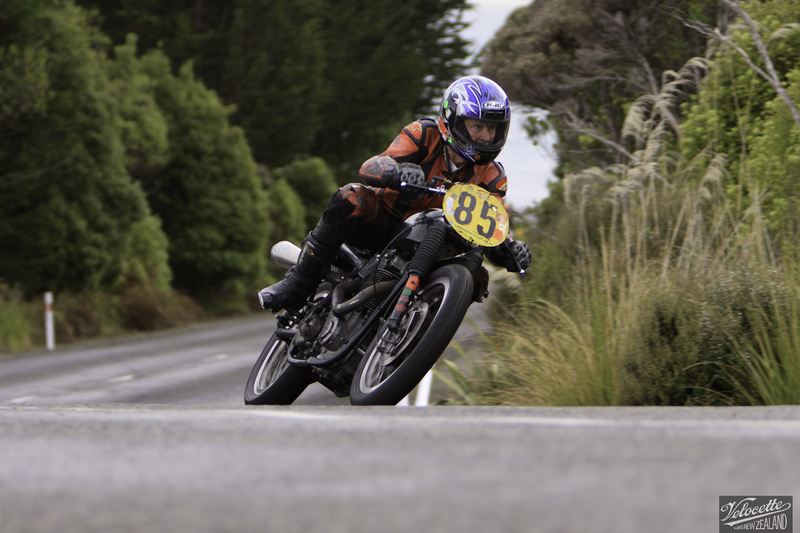 Graham Peters aboard his BSA Goldstar 500 from start to finish of the tortuous Bluff Hill Climb. Kevin Ryan & Bruce Aitken’s runs up Bluff Hill from start to finish. The Big Velo in fine fettle, Pit Lane, Pearce Street, Bluff. Pit Lane, Pearce Street, adjacent to the Start line.